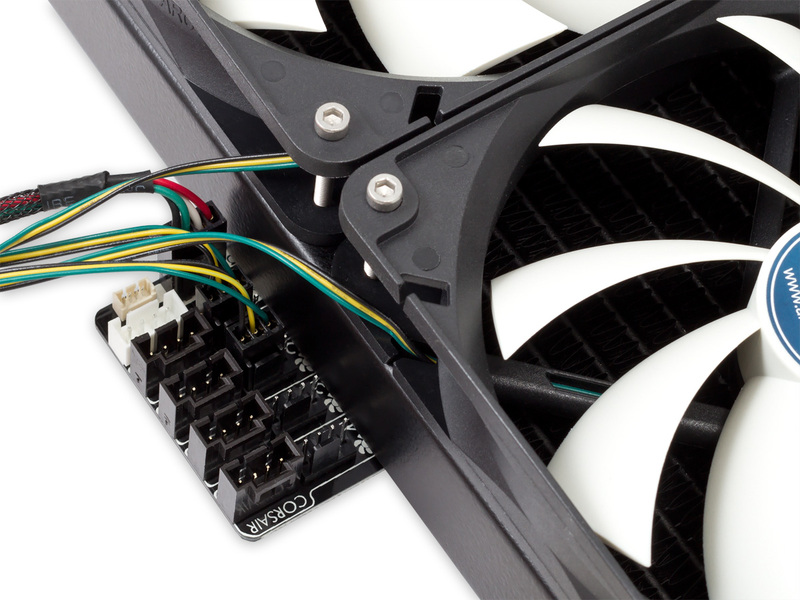 QUADRO is the next generation of an autonomously working smart control for fans and LEDs. The device combines a 4-channel PWM fan controller including monitoring functions with a RGBpx LED controller in a compact housing. QUADRO can be used universally in any PC, no matter if water or air cooling is used. 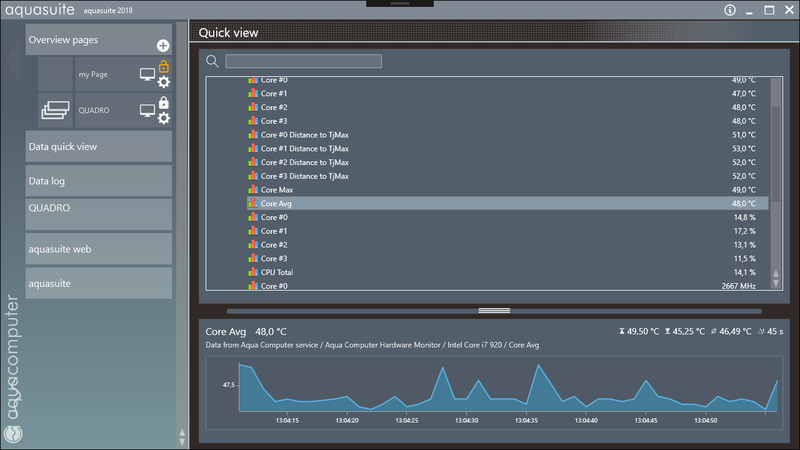 In combination with the aquasuite software, QUADRO becomes a powerful monitoring instrument. 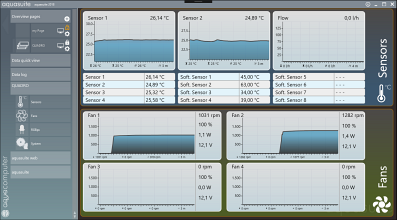 In the aquasuite software all sensor data can be visualized individually. The data can be displayed on a ready-made overview page and it is also possible to create your own views. All device settings as well as future updates can be processed in a user-friendly way with the aquasuite. Any number of devices can be used simultaneously - each with its own settings and evaluations. Up to 25 watts can be connected to each of the four fan channels, which corresponds to a total output of generous 100 watts. An overload protection for all channels prevents the QUADRO's fan electronics from being damaged in the event of operating mistakes. Each channel can be switched off completely if required. This is a special feature since the 12 volt voltage is normally permanently applied to PWM outputs. An optionally adjustable start boost allows the fans to start in a reliable manner. The start boost is executed until a speed signal is detected at the corresponding output. 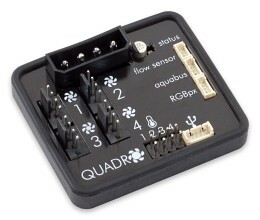 Four analogue temperature sensors and a flow sensor can be connected to QUADRO. 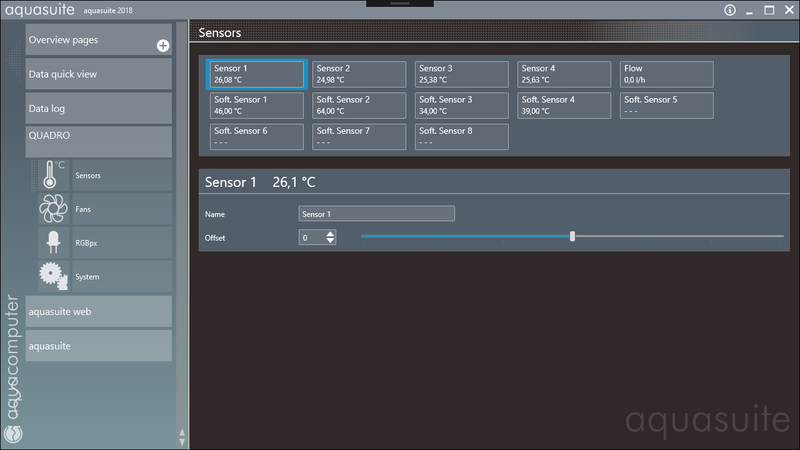 Eight additional sensor values can be transferred from the computer to the QUADRO in the form of software sensors. 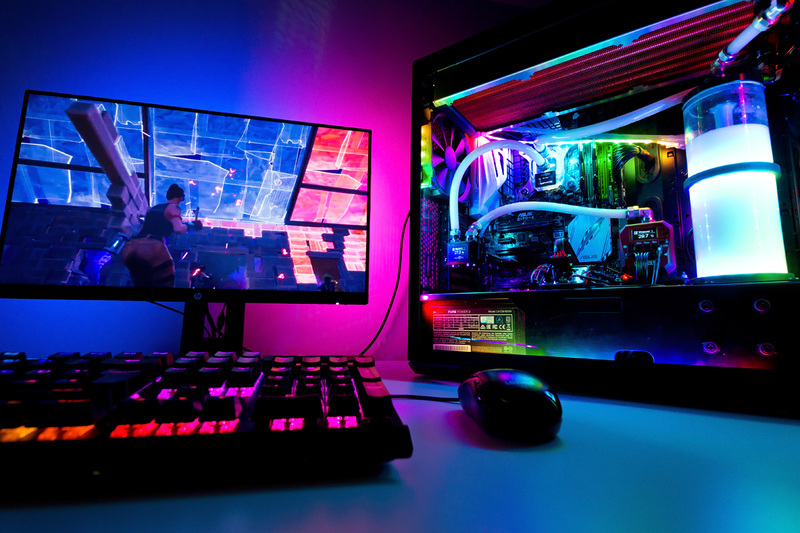 For example, it is possible to control outputs directly according to the CPU or GPU temperature or to visualize the load by using LED strips. 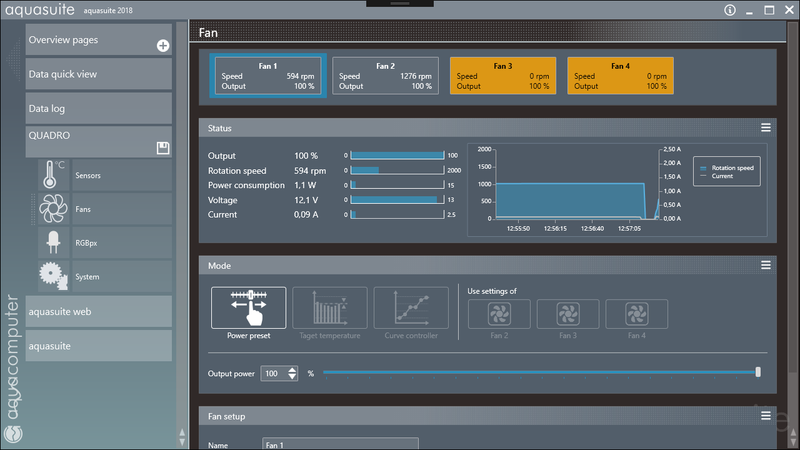 Each fan output can be configured individually. In addition to manual settings of the output power, automatic control is also possible. A setpoint controller with temperature setting and a curve controller are available. For the setpoint controller the desired temperature is being is set and the fan is controlled automatically as required. 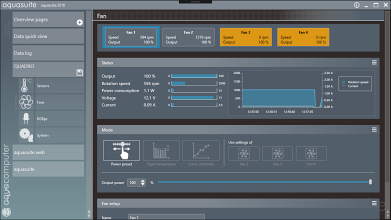 Experienced users can also optionally adjust the PID controller settings. 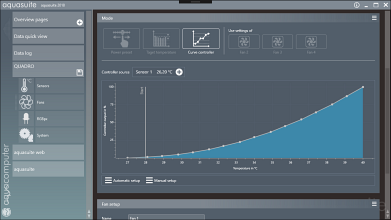 The curve controller defines a power curve with temperature and power values via 16 freely adjustable points. The QUADRO is the first device equipped with the new RGBpx technology. RGBpx offers the possibility to individually control every single LED of compatible LED strips or fans to one of 16.8 million colors. In addition to smooth animations and breathtaking effects, this also makes it possible to adapt the lighting to your individual wishes. Thus the workplace can truly shine in the right light. 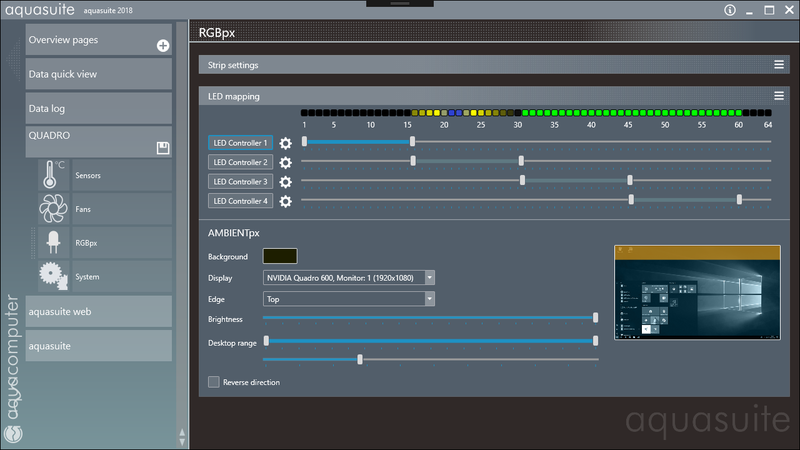 QUADRO has an RGBpx connector on which up to 64 LEDs (up to four Aqua Computer RGBpx strips) can be operated. Effects can be applied to the LED strips with four independent controller settings. Each of the four LED controllers of QUADRO can be assigned to one of the 23 possible effects. All effects offer additional settings. In addition to adjustments for the coloring, stepless controls also allow to influence the speed or intensity in a wide range. Due to the high update rate, even slow transitions are displayed smoothly and without flickering. Many effects can also be actively influenced by a data source. 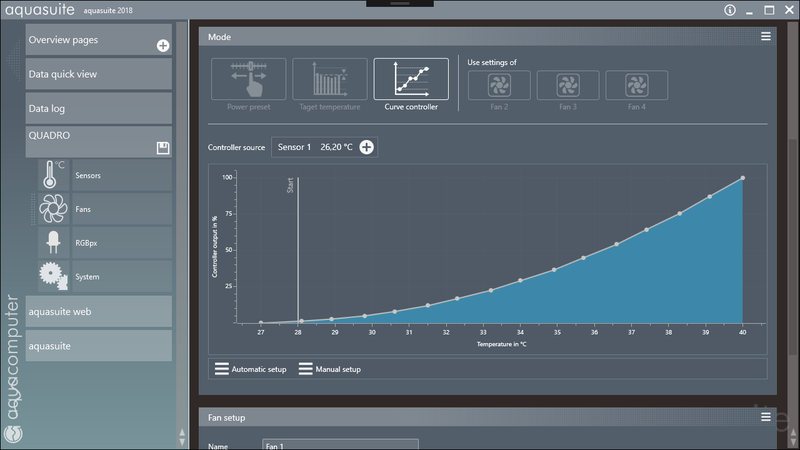 Effects can be coupled to any sensor value such as temperature or load. Since the effects can be placed anywhere on the LED strips, most of them can also be combined: For example, LEDs 1 to 16 may have a rotating color change while LEDs 6 to 11 have a temperature-dependent color change from blue to red. This provides a temperature indicator which is flanked by a rotating color change on the left and right side. The effects are processed in a similar way to a video editing program. The uppermost controller is always visible and covers the effects of the controller below it within the set range. Aqua Computer will introduce a range of accessories for the RGBpx series in the next few weeks. These include strips, AMBIENTpx sets and other lighting products. 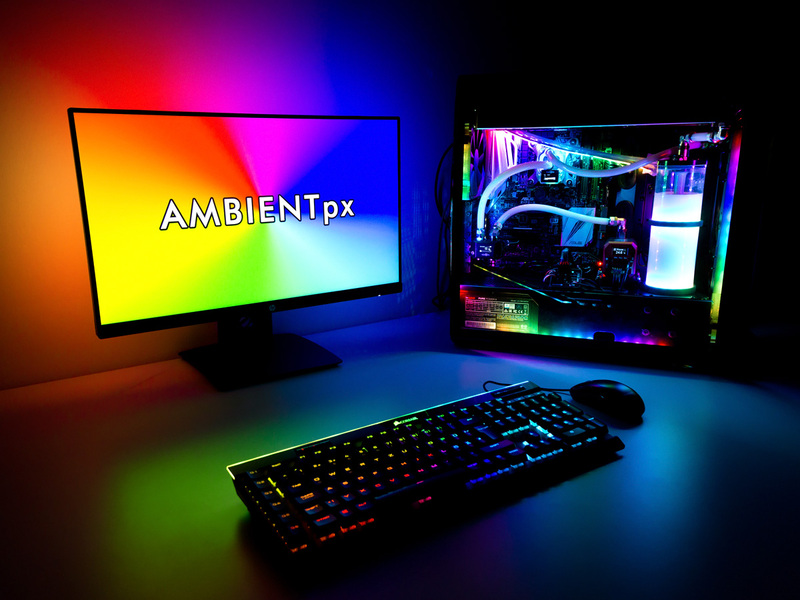 AMBIENTpx immerses the environment in a dynamic lighting mood. 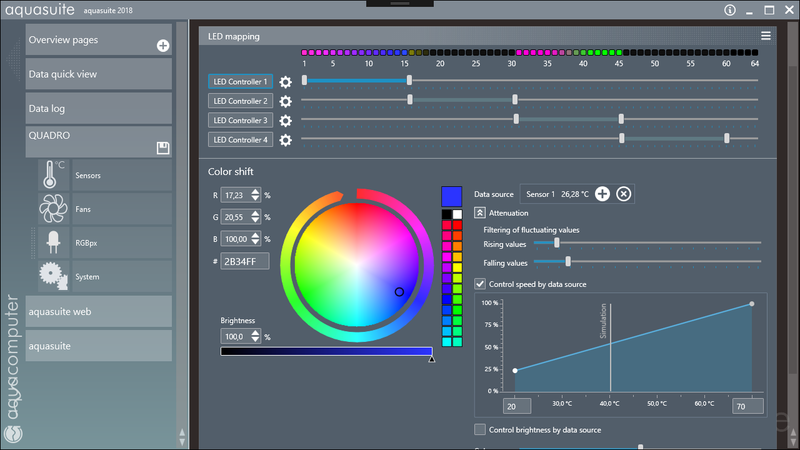 The current image content of the monitor is analyzed in the background in real time and the color mood is displayed on the LEDs. This creates an intense experience with movies or games because the image will look much bigger than it actually is. The analysis of the image content can be individually adapted. Thus, the area to be analyzed can be set very narrow but also very wide. 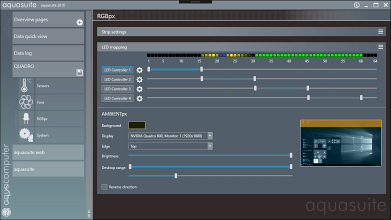 The settings also support multi-monitor setups and automatically adapt to the image format of movies. In addition to being used as an autonomous USB fan controller, QUADRO can also be used as an aquabus extension for an aquaero 5/6. In this case the four QUADRO fan outputs as well as the four temperature sensor ports and the flow sensor port are available to the control and monitoring features of the aquaero. A maximum of two QUADRO units can be connected to an aquaero. Both functions are independent of each other. RGBpx Splitty4 can also be used just as a fan splitter or as a pure lighting adapter. In the function as a fan splitter, fans with 3-pin and 4-pin connectors can be used, provided that the connected fan output supports these types (voltage-controlled/PWM signal). The speed signal of a connected fan (plug labeled with "rpm") is fed back to the fan output. Note: A mixed connection of lighting systems from different manufacturers is not possible! Die Platine kann z. B. sehr einfach an zwei nebeneinanderliegenden Lüftern oder einem Radiator befestigt werden und ermöglicht so eine optisch sehr ansprechende Kabelverlegung ohne den üblichen "Kabelsalat". Damit ist sie für viele Radiatoren die beste Möglichkeit zur sauberen Verkabelung der Lüfter. The board can be easily attached to two adjacent fans or a radiator, and thus enables a visually very attractive wiring without the usual cable clutter. This makes it the best way for many radiators to cleanly wire the fans. 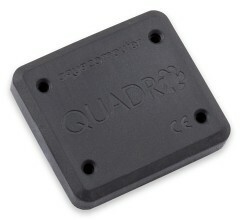 QUADRO and the optional RGBpx Splitty4 board will be available shortly and can be ordered in the Aqua Computer Webshop. QUADRO costs 39.90 Euro and RGBpx Splitty4 is offered for 8.90 Euro (prices include VAT). This looks amazing. Would this be worth considering if I already have a Farbwerk? Maybe... QUADRO can use addressable LEDs so you will get much more possibilities to control the LEDs. If you like the effects the upgrade might be useful. If you just want some background illumination the farbwerk will still do its job. I'm looking at the RGB Splitty 3, would this permit me to use my farbwerk and still have some addressable RGB lights? Or is that for a different purpose? 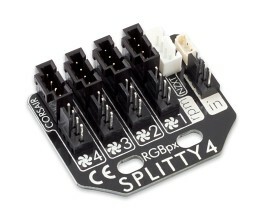 No, Splitty3 can only work for RGB LEDs and has nothing to do with addressable LEDs. It is just a splitter that can be used for "classic" RGB LED ports like the farbwerk or some mainboards. Forgive the naïve questions - I'm new to aquacomputer products trying to figure out which I need. Can this control fan speed based on a virtual / calculated temperature (delta) from the sensor inputs like the aquaero can, or does it just pass on a PWM signal? Can I use it to distinguish between groups of temp inputs and fan outputs as belonging to separate cooling loops? 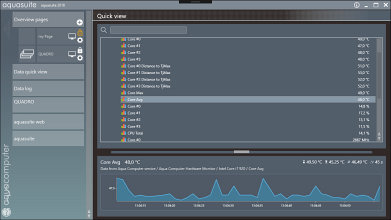 QUADRO does not offer virtual temperature sensors. You can only work with the values coming directly from the (physical) sensors or from software sensors. I am not sure about your second question. 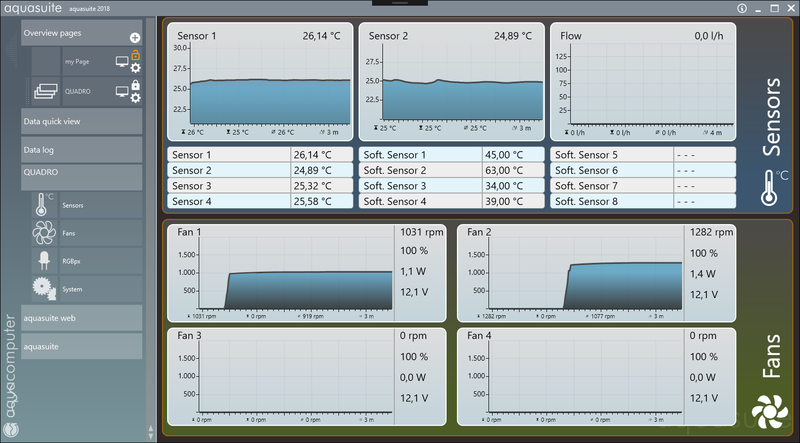 Of course you can freely map any temperature sensor to any fan output. So managing two loops with different temperatures or fans is no problem. Using a Quadro and a Splitty4 would allow 4 fans per channel so 16 fans from 1 Quadro. 1. I understand that the RGBpx function only works via USB, not via aquabus... Is it possible to hookup both USB and aquabus at the same time? So the RGBpx stuff is controlled via USB but the 4 fan channels are controleld by an Aquaero 6XT? 2. 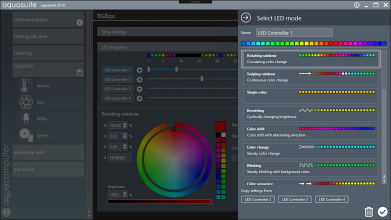 When the LEDs are programmed in the Quadro is this saved on the device? So I can set up my LEDs via RGBpx/Aquasuite and then run MacOS without the Aquasuite software running and the LEDs will still work as I programmed them? Or maybe just unplug the USB port? 3. When using the Splitty4 with Corsair ML fans... Is it possible to add more than 4 fans per Quadro? I guess the 4 fan limit is due to the total number of LEDs? LL fans have 16 LEDs each, totalling 64 for 4 of them, but the ML fans only have 4 LEDs each, so in theory I could hook up a lot more fans if I wire them correctly? I guess the pinout would involve +5v, Data+, Data-, and GND? If I powered each fan with 5v and ground, and then looped the data lines in and out of each fan is series, would that work? Assuming I don't go over any current limits or add more than 64 LEDs? The reason for my question is that I will need 4x Quadro's and 4x Splitty4's to run the LEDs on my 15 Corsair ML fans, but even all those fans together is still less than 64 LEDs, so I'm hoping with the correct wiring I could run the LEDs from all 15 fans from one Quadro. 4. Is it possible to use the Corsair RGB strips with the Quadro and/or Splitty4? If I wire the strip correctly, could I plug it in as if it were a corsair fan? Again assuming I am within current limits and under 64 LEDs total. Thanks for taking the time to read my questions. The Quadro looks like an aweome product and I look forward to never having to use Corsair software ever again! 1.) Yes, can be done. 2.) ALL settings are saved in the device. A USB connection or the software is not required after you have configured everything. 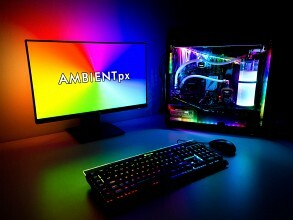 Please note that some features like software sensors or the AMBIENTpx LED effect require a USB connection and the software. 3.) You can add more fans to control their speed by using y-cables or further splitter cards but the number of groups is limited to four. 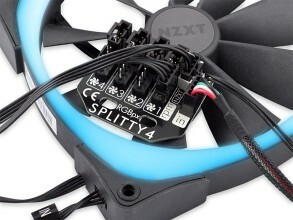 Since these fans have only four LEDs you could also connect the other LEDs if you do it the right way (we won't explain that in detail since it bears too much risk to damage something). Like the fans in general, you can not have more than four groups since there are only four LED controllers available. 4.) We don't know if they are compatible. THE BELOW INFORMATION IS ONLY THEORY, I HAVE NOT TESTED ANY OF IT. DON'T BLAME ME IF YOU TRY THIS AND BLOW YOUR FANS UP. For anybody who is interested... I've done a bit of research, as well as opened up one of the corsair fan LED hubs to check the wiring... It seems that, with only a small modification, one of these corsair fan hubs can be connected to each LED port of the Splitty4... Allowing a maximum of 24 corsair fans to have their LEDs connected a single Quadro. There is still the limit of 64 total LEDs of course, meaning that you won't be able to actually control that many fans, even if you connect them all. Some fans like the Lightloop ones (16 LEDs each) can only have 4 connected. 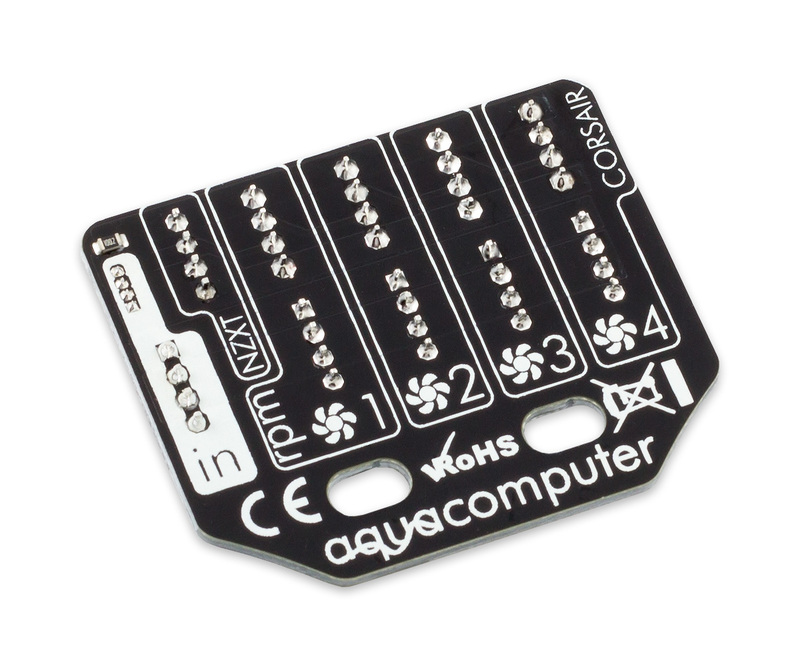 But the Maglev ones that I use only have 4 LEDs and I only have 15 in my case (15x4=60) so it should be all good! It seems like all that is needed is to rewire the 3 pin connector (the one that normally goes to the Corsair Lighting Node) on the Corsair fan hub so that the "5v out" pin becomes a "data return" pin. It looks like this will need 2 small cuts on the PCB and 1 small jumper wire soldered in place. After that a custom cable will be needed, 3 pins on one end and 4 on the other, (wired with the correct pinout of course!) 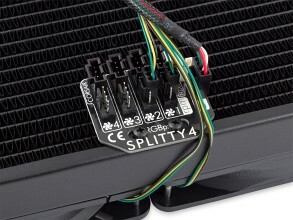 to connect the Corsair LED hub to one of the Splitty4's Corsair fan ports. The first port on the Splitty4 should work without the mod but this will mean none of the other ports will work... And it still requires a custom made cable. I'm going to attempt all of this in the coming weeks so if anybody is interested in the results, let me know any I'll post them here... Or on overclock.net if that's more appropriate. Let me know if you're interested in seeing the results of this. PLEASE REMEMBER THIS IS ONLY THEORY AND I HAVEN'T TESTED IT YET!! I forgot to ask about the addressable leds So If I can hook up 4 fans per channel on a Splitty4 I’m assuming that is with a 4 way pwm splitter on each pwm channel correct? But for the fans addressable leds the Splitty4 can only handle 4 fans total correct? So how do I hook up the leds on the other 12 fans up? Can I use the lighting nodes that come with the fans and what’s this limit of 64 leds mean. Can I use multi Quadros and Splitty4’s please go into more detail about what I need to do to hook up 24 LL120 Corsair fans of should just stick with Corsair’s commander pro’s which can be daisy chained and their i-Cue software? I'm in the same boat as the others in complete confusion as I don't know how I could go about if I were to use x9 Corsair LL RGB LED Fans. I would like to keep it as simple as possible without any modifications being done. A visual explanation would be great if possible. I was of the understanding that the RGBpx Splitty4 would only do 4 LL120 fans each. Is this true? Correct, you can only connect four RGB fans to a QUADRO (via Splitty4). For 24 RGB fans you would need six QUADRO and Spliity4. Connecting so many of them to the aquaero is not possible nor would it make sense because the aquaero has no access to the RGBpx features. You will have to connect them via USB with a Hubby7 for example. If we stay within the power limit this is true for the fan control but not for the LEDs. You can control the fans as groups and they will run with the same settings per group but this is not possible for the LEDs. I forgot to ask about the addressable leds So If I can hook up 4 fans per channel on a Splitty4 I’m assuming that is with a 4 way pwm splitter on each pwm channel correct? But for the fans addressable leds the Splitty4 can only handle 4 fans total correct? So how do I hook up the leds on the other 12 fans up? Can I use the lighting nodes that come with the fans and what’s this limit of 64 leds mean. Can I use multi Quadros and Splitty4’s please go into more detail about what I need to do to hook up 24 LL120 Corsair fans of should just stick with Corsair’s commander pro’s which can be daisy chained and their i-Cue software? As said for 24 RGB fans you will need six QUADRO controllers and six Splitty4 boards. I am not familiar with the Corsair RGB stuff but since the fan and LED control runs through independent lines I see no problem to control the fans with the QUADRO and the LEDs with the Corsair stuff. For nine RGB fans you would need three QUADRO controllers and three Splitty4 boards. How would I go about connecting all of those boards? Splitty4 to each QUADRO, assuming nothing is connected to each QUADRO other than the Splitty4, and the QUADRO via aquabus or USB only? If USB, I don't have any room for more USB on the PC, can I chain another HUBBY7 to another HUBBY7 for more USB headers? For anybody who is interested, I have successfully modded some of my Corsair LED fan hubs to work with the Quadro and Splitty4... This has allowed me to plug in 16 Corsair ML fans to just one Quadro and Splitty4... Normally this would need 4 Quadro's and 4 Splitty4's, at significant extra cost and adding heaps more clutter in the case. 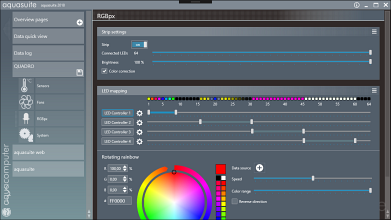 Please note, I'm talking about LED control only here, using RGBpx... Fan control is entirely seperate and much simpler. I plugged in 11 ML fans tonight on a test bench and it all worked perfectly... But should also be fine with up to 16 fans. You can plug in more fans (up to 24) but are limited to 64 LEDs in total. The mod involves cutting a small trace on the PCB of the corsair LED fan hub and add a short jumper wire. As well as making a 3-pin to 4-pin cable to connect each fan hub to the Splitty4. I have confirmed that the Corsair addressable LED strips work with the Quadro as well. They simply require a custom cable as well. 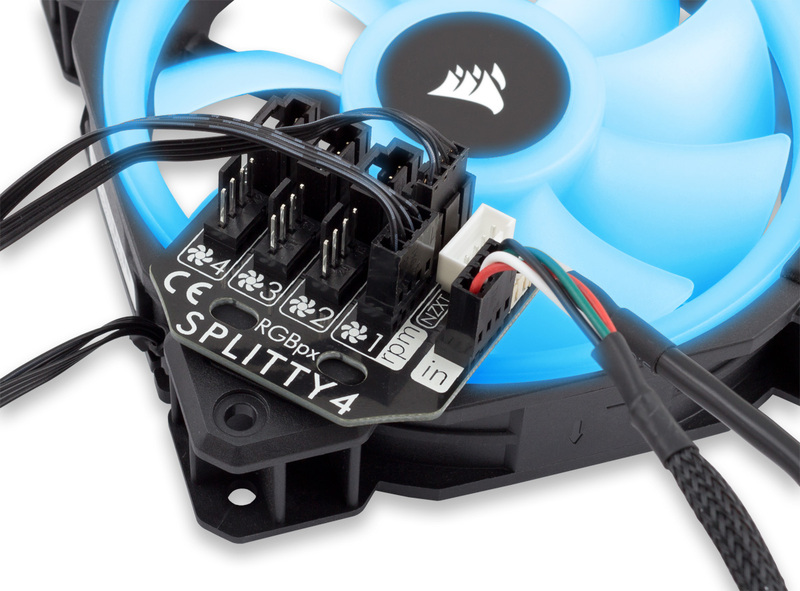 Below is a photo of the PCB mod on the Corsair fan hub... Sorry for the crappy lighting, it's late at night here. PLEASE NOTE... THIS MODDED FAN HUB WILL NO LONGER WORK WITH CORSAIR LIGHTING NODE PRODUCTS... IF YOU TRY THAT IT WILL PROBABLY BLOW UP YOUR FANS!!!! I HAVE USED A PIN THAT IS NORMALLY 5V AND CONNECTED IT TO THE DATA LINES OF THE FANS. Here is a quick demo I made of a single Quadro and Splitty4 controlling 13 Corsair ML fans... This build still has a long way to go so please excuse the mess... I will be installing lots more stuff soon, just thought some ppl might be interested to see what can be done with the Quadro. When I'm finished all LEDs in this build will be controlled by Quadro's using RGBpx. I am new to this forum, but are looking into the wonders of this new Quadro controller. Is it possible to control speed on the pumps via the PWM headers on the Quadro controller?